As the cool breeze drifts over, Oasis is the ideal place to enjoy a cool drink, freshly squeezed juice or graze from our menu designed to meet your poolside cravings. 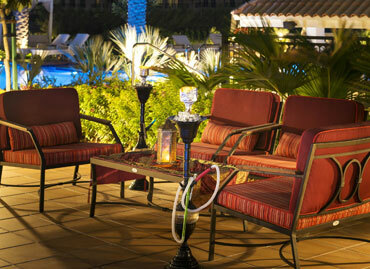 As the sun sets, Oasis continues the relaxing vibe and offers an exclusive Arabic lounge and dining experience until late night, enhanced with traditional shisha service. Tuesday to Saturday from 9:00 pm—12 midnight, groove to live entertainment, savour Arabic speciality cuisine – tandoors & grills. For reservations, please call or whatsapp +971 56 545 8391.